Do Energy Gels Work? GU, PowerGel, Clif, Huma, Honey, etc. If you’ve ever watched or have been exposed to activity that requires a lot of endurance, you’ve probably seen athletes squeeze oddly shaped packets into their mouths and throw them to the ground. Inside these packets contain a gooey substance commonly referred to as goo, but marketed in the industry as energy gel. 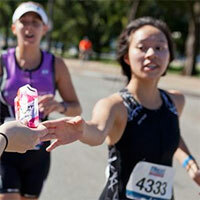 It is advertised that athletes are supposed to consume multiple packets with water during endurance events. 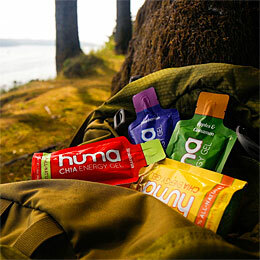 Energy gels come in a variety of brands, colors, and flavors. They are a convenient and portable way to fuel the body with carbohydrates during high endurance activity. The carbohydrates in the gel delay muscular fatigue by delivering calories in the form of simple sugars. Most energy gels are purely carbohydrates, so they can be digested quickly. Some of the energy gels sold in stores also contain ingredients that are believed to enhance performance such as ginseng, amino acids, vitamins, and caffeine. How do energy gels work in your body? When participating in any high endurance activity, your body uses two sources of energy: fat and carbohydrates. Fat is most abundant in the body, but it is metabolized very slowly, which makes it the least efficient fuel source. Because carbohydrates can be broken down into usable energy faster, the body implements carbohydrates as the primary fuel source when participating in high intensity activity. The problem with using carbohydrates as the primary fuel source is that there is a maximum capacity that our bodies can store. Glycogen is stored in both the muscles and liver; however, when participating in endurance activity, the energy that is used immediately is the energy that comes from the glycogen stored in the muscles. What this means is that when you ingest energy gels not all of the glucose consumed goes directly to the muscles being used. Why do you need energy gels and do they actually work? Energy gels are generally marketed as some sort of ultimate powerful formula that will allow people to have superhuman powers, laser heat vision, and walk their dogs at the same time. In reality, energy gels should only make a difference in overall performance if you’re exerting large amounts of energy over a long period of time i.e. running a marathon. This is because it takes a little less than an hour for the body to digest and use the gel as a source of energy. Therefore, if you’re planning on running for more than an hour it may not only be beneficial, but necessary to consume energy gels. There are two main physiological benefits associated with consuming energy gels. The immediate surge of energy your body exhibits and the following energy release after sugars have been metabolized in the digestive system. Therefore, the benefits of consuming an energy gel are not limited to processing sugar as a carbohydrate, but also sensing the presence of a nutrient that is to come. If you’re planning to exercise for long periods of time, it’s necessary to consume the right balance of carbohydrates. It is suggested that carbohydrates be consumed in a 2:1 glucose to fructose ratio (the same ratio found in fruits) before prolonged strenuous activity. When partaking in strenuous activity, your body tends to stop or slow blood flow to and from the digestive tract in order to increase the amount of blood flow and therefore oxygen to the muscles being used. This is why runners often stop at the side of the race to throw up gels or fluids right after consumption—especially if they consume the gels late into a marathon race. If energy gels are consumed earlier into the race, they should be able to be digested as they normally would. The recommended use of energy gel is around 15 minutes before starting and around 30-45 minutes after beginning the endurance exercise and each 30-45 minutes during the exercise.4 Of course, this is the average derived from testing and the exact amount of energy gel intake is dependent upon the individuals’ metabolism, weight, and resting energy expenditure. 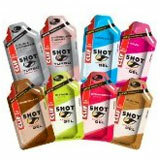 Where can you buy energy gels? You can buy energy gels from just about every major retail store including GNC, REI, Walmart, and many others. Of course, you can also easily purchase energy gels online from different etailers and have them shipped directly to your front door. My favorite place to purchase energy gels is online via Amazon because there are a ton of different brands to choose from. If you’re a first time buyer, buying from Amazon is also great because you can get valuable user feedback by reading hundreds of product reviews posted by others who have already tried out the different gels. Click here to browse top sellers. Energy gels are good for high endurance activities. Athletes that perform at lower intensities have lower rates of carbohydrate oxidation, so carbohydrate consumption should be decreased accordingly. Carbohydrate intake strategy should be balanced with a fluid intake plan because concentrated carbohydrates like energy gels tend to reduce fluid absorption. If you’re going to participate in a high endurance activity you should train while taking everything into account and this includes nutrient and fluid consumption. Carbohydrate intake doesn’t have to be limited to gels, there are also solid carbohydrate supplements (bars) that can be used as an energy source, but it is up to the individual to find what is most comfortable for them. 1. Berg JM, Tymoczko JL, Stryer L. Biochemistry. 5th edition. New York: W H Freeman; 2002. Chapter 21, Glycogen Metabolism. 2. Patterson SD, Gray SC. Carbohydrate-gel supplementation and endurance performance during intermittent high-intensity shuttle running.Int J Sport Nutr Exerc Metab.2007;17:445–455. 4. Patterson SD, Gray SC. Carbohydrate-gel supplementation and endurance performance during intermittent high-intensity shuttle running.Int J Sport Nutr Exerc Metab.2007;17:445–455. Can Steroid Abuse Lead to Alcohol and Drug Abuse?